This week at PopMatters, I talk about Anna Anthropy's book, Rise of the Videogame Zinesters. It's a lively read with a simple, yet powerful message: everyone should make video games! The book's subtitle is kind of a mouthful ("How freaks, normals, amateurs, artists, dreamers, dropouts, queers, housewives, and people like you are taking back an art form"), but it does a great job of encapsulating her message: the video game landscape is lacking in diverse experiences because entrenched (and moneyed) players have traditionally had a monopoly on production and distribution. The types of skills needed to code a game, the technology needed to produce it, and the capital needed to distribute it have had high barriers to entry. This is not so today: thanks to tools like Scratch and Gamemaker (or even Wario Ware: D.I.Y. ), anyone with a relatively modern computer, an Internet connection, and the will to learn can make and distribute their own games. Anna's remedy for the homogeneous malaise that so often afflicts mainstream gaming is simple: the proliferation of more numerous, more diverse voices will inevitably make the medium more representative of our society. Traditionally underrepresented populations (women, the queer community, non-programmers) and traditionally underrepresented game topics are much more likely to flourish if people can take on the responsibility of creation and distribution without being beholden to large corporations. True, many of the games that people will create won't be outstanding, but most of what people create in general isn't outstanding (see: YouTube). Then again, there will inevitably be some truly special things that would have never survived the constrictive traditional studio/publisher set up (see: YouTube). More than anything, the book is an enthusiastic rallying cry for people to get personally invested in contributing to the medium. Anna is refreshingly candid about her early struggles with programming and her disappointing time at Southern Methodist University's game design program. 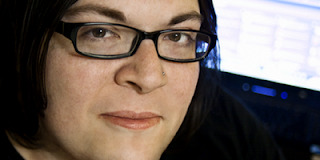 She didn't fit the stereotypical mold of someone who works in the games industry, but then again, few people do. That doesn't mean she, and others like you and me, can't make games. In fact, maybe that means it's more important we do.